Everett Clair Ingels, eldest son of Bert and Lizzie Ingels, was born June 6, 1891. He became a member of the M. E. Church at Clay Chapel at eleven years of age under the ministry of Rev. H. F. Prior. He entered Gallipolis high school at the age of thirteen, completing his school work and graduating in 1910. During his high school years he spent much time in preliminary pharmacy work. He spent one year in the College of Pharmacy at Indianapolis, Ind., and one year at Ada College of Pharmacy, where he graduated in 1912 on his 21st birthday. He passed the state examination for a registered pharmacist when he was barely of legal age and accepted a position at once at Carey, Ohio. 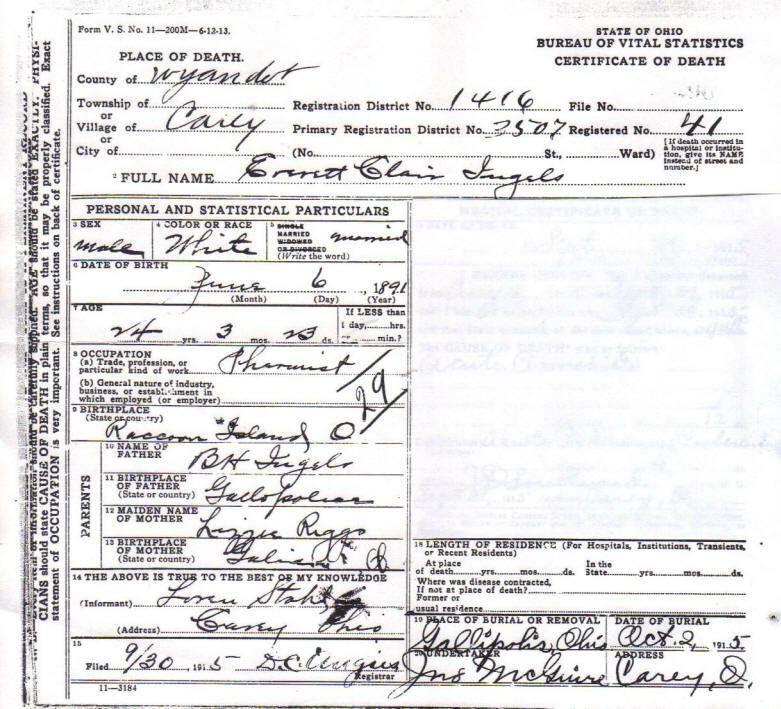 He later went to Cleveland where he was manager and registered pharmacist in a large drug store, and which place he was occupying when illness took him from his work on July 10. 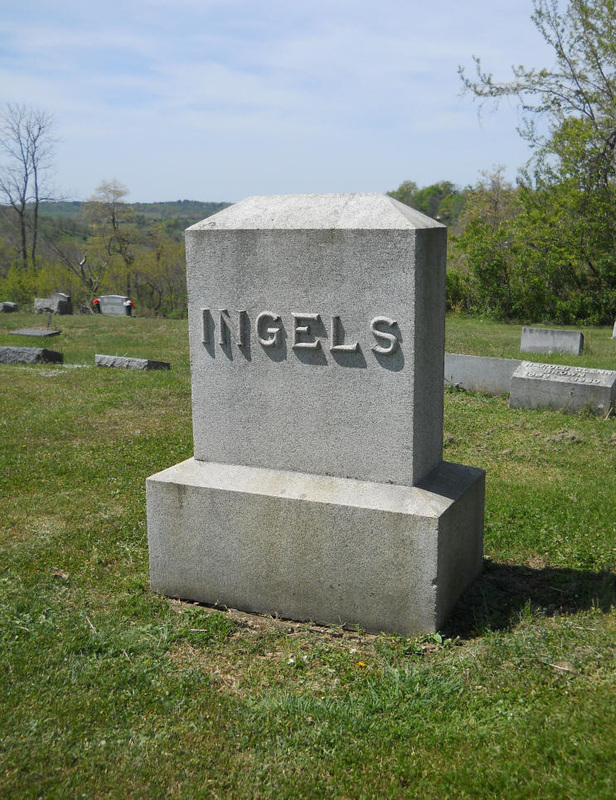 Mr. Ingels united in marriage with Miss Hester Stahl of Carey on Jan. 25, 1915, and leaves a noble young wife to mourn for him. Besides his wife, his parents, brother Truman, sisters Frances and Mildred, he leaves a host of relatives and friends to whom he was very near and dear. He was a noble Christian young man, to whom life was dear, yet when he knew a dreaded disease held him, he was reconciled to leave his dear ones here to go to his Heavenly home. He took great comfort in having those about him read the blessed promises in the Bible to him, and to offer up prayer for courage and comfort in the hour of need. Though the Reaper has taken this flower in the springtime of life, and his dear ones are borne down with grief, yet they are blessed in the assurance that he was prepared for his Heavenly home which awaited him. He was loved and respected by all who knew him; was a devoted husband, son and brother, a loyal friend, and his life a pure, noble Christian one. 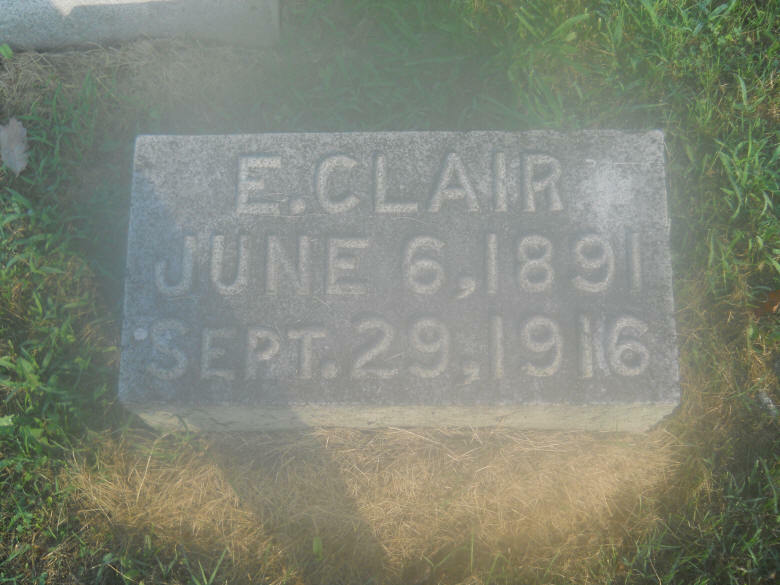 His spirit went to receive its reward of such a life on Sept. 29, 1915, at the home of his father-in-law at Carey, Ohio.